The 20th anniversary of the Sailor Moon Manga's release, as well as the launch of Sailor Moon Crystal, has seen kind of an explosion in Sailor Moon marketing mania recently. We've had tortilla chips, we've had animé contacts, and now the Sailor Senshi are getting into... the tiny, replica food market? Huh. The Power of Sailor Moon Branding comes to... Tortilla Chips? The teeny, tiny replica food is inspired by a similar collection of mascot trinkets released in Japan, and features a variety of sweet treats and snacks inspired by the Sailor Moon cast. 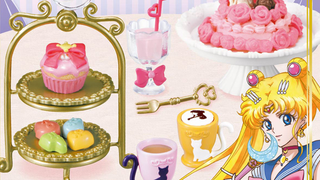 Aside from a series of Senshi-specific little plates, Rei gets a teapot and cup, as well as some cookies, Makoto a slice of pie, Minako an Artemis-shaped pancake and Ami, a jello mould of herself. Which seems oddly vain for someone like Ami, but let's just leave it at the absurdity of a tiny fake Jello shaped like Sailor Mercury, shall we? Not to be left out, Mamoru is represented by a tuxedo-clad vase holding in a single rose, because all he's good at is standing still and doing jack all, anyway. The sweet cafe range of teeny-weeny fake food is due out in May in Japan, with each specific Senshi-themed set clocking in at around $5 each. But if you're going to go the whole hog and have tiny fake food fit for an action figure, you might as well have a figure to go with it. Step in the rather conveniently timed unveiling of Bandai's latest Sailor Moon Figuarts toy! The Super Sailor Moon was recently teased by Bandai at Wonder Festival 2015, but now they've released a set of promo pictures to probably entice you into picking one up alongside a cavalcade of tiny plastic cakes for a Senshi figure-tea-party. Which I'm sure is something people do all the time. Based on Sailor Moon's 'Super form' from the SuperS seasons of the anime, the figure comes with the Spiral Heart Moon Rod and Holy Grail as well as articulated hair, because come on, it's Sailor Moon. Of course her hair is articulated. The figure is due out in a few months in Japan. Never change, weird Sailor Moon Merch. Never change.